How Long Do You Smoke Hamburgers? Fancy bbq food is great, but sometimes you just want a burger. 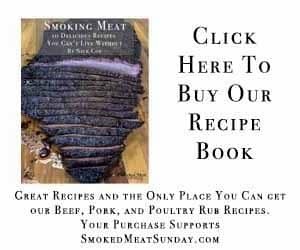 There are a lot of different ways to make a smoked hamburger. This is my favorite. Most people make burgers on a gas or charcoal grill. They turn the heat up to high, then cook for three or four minutes per side. Burgers barbecued this way turn out good. But there is a better way! Smoked burgers take a little longer, but the flavor you get is worth it! 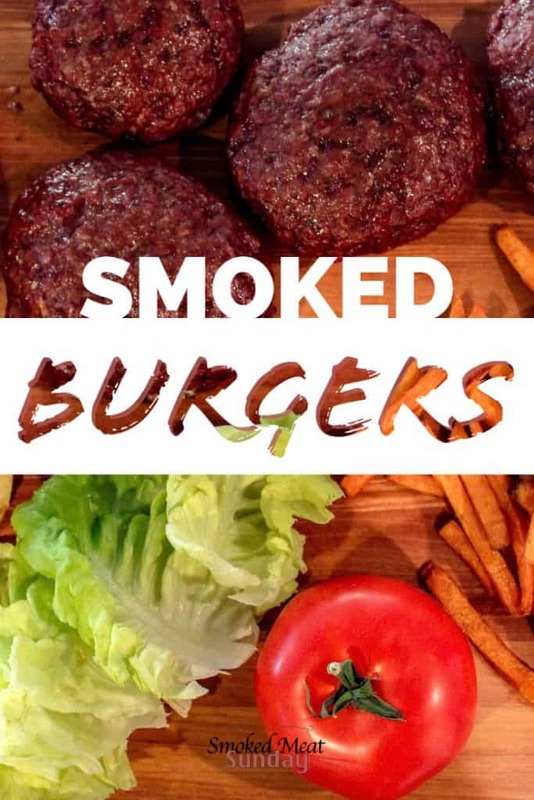 The best meat for smoked burgers has a higher fat content and is raised antibiotic and hormone free. 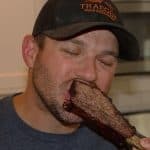 I really like the Wagyu Beef from Snake River Farms. If you’re looking for the best meat for burgers, this is it. If you’re going with store bought burgers, make sure you get a mix of at least 85/15. My preference is 80/20 or even 73/27! As you can see, I like using higher fat content ground beef. All that fat is going to render out and give you one of the tastiest burgers you’ve ever had! A smoked burger is a treat! I know you’re still wondering, how long do you smoke hamburgers. We’re almost there! It doesn’t take long to make your smoked burger patties. The size of each patty is totally dependant on how big the bun is that you’ll be using. Know that the patties will shrink a little while they are cooked. Make sure they are a little bit larger than the bun, and at least a 1/2 inch thick. I like to keep it simple with my smoked burger seasonings. All I do is sprinkle a little bit of salt and pepper on each side, and then give them a splash of Worcestershire Sauce. 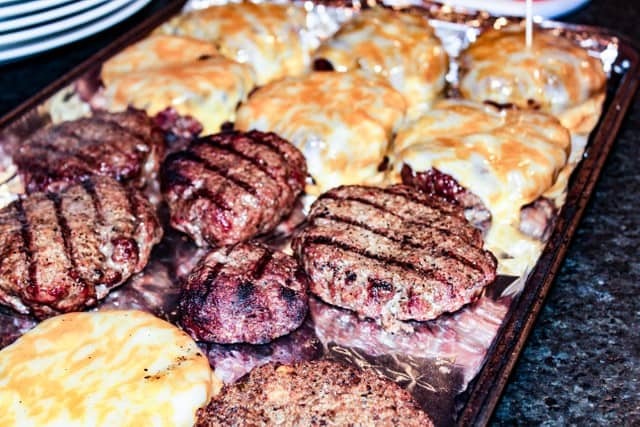 When the patties are formed and seasoned, it’s time to throw them on your Traeger! Set your grill to smoke (~150 degrees), and let your burgers smoke for about one hour, or until the internal temperature is 125 degrees. Know Your Internal Meat Temps People! I’ve talked a lot about internal temp, and if you don’t have an instant-read thermometer, you’re doing your barbecue a disservice. When you know your temps, EVERYTHING gets easier. When the burgers have been smoking for an hour, pull them off the smoker. Turn the heat up to high (400+ degrees). When the smoker is up to temp, put the burgers back in. Let them cook for two to three minutes per side to give them that good sear on the outside. I like to cook my smoked burgers to medium rare (135 degrees), but my wife likes medium (145 degrees), so again, use your instant-read thermometer to make sure you get it right! I’ve pulled my burgers too early before, and my wife was not pleased!! If you’re adding cheese, throw the slices on after the first flip. I like mustard and a good barbecue sauce on my burgers. If you’ haven’t already, check out my blueberry barbecue sauce recipe! It pairs perfectly with a Smoked Hamburger. If you were wondering how long do you smoke hamburgers? Now you know! Smoke the burgers for about an hour, or until the internal temp hits 125 with an instant-read thermometer. 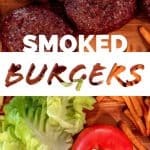 If you haven't tried making smoked burgers, you're missing out! These smoked burgers are juicy on the inside, and the seared outside crust is AMAZING. Previous PostHow Long Does it Take to Smoke Meat?